I suspect something fishy is going on among Syrian opposition leaders. Five days into the armed opposition’s spectacular advances on the mountains of the coastal province of Latakia, Bashar al-Assad’s heartland, bigwigs in the Free Syrian Army (FSA) and Syrian National Coalition (SNC) are believed to be lobbying for cessation of the campaign. Interviewed live on air last night, the Latakia campaign’s field commander of the central western front, Col. Mustafa Hashim, said his men were being deliberately starved of arms and munitions. 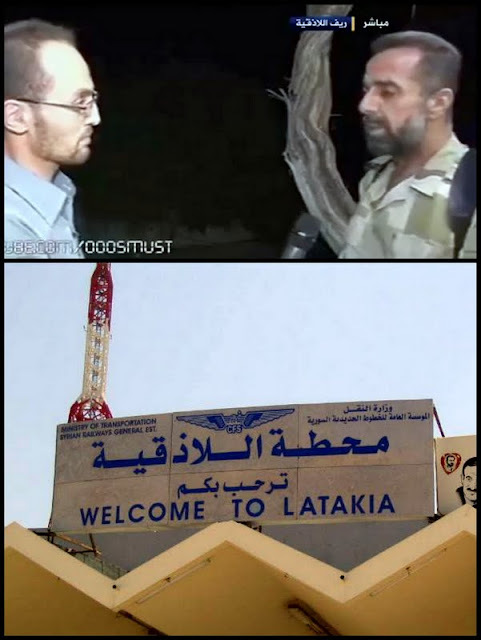 “Our (western) front has not been treated on par with the other fronts since our (FSA) meeting in (the Turkish resort of) Antalya” last December, Col. Hashim told Melad Fadl, his interviewer from Aljazeera TV on the Latakia mountains. The Antalya meeting organized the FSA into five fronts: the northern front (Aleppo and Idlib), the eastern front (Raqqa-Deir Ezzor and al-Hasakah), the western front (Hama-Latakia-Tartus), the central front (Homs-Rastan) and the southern front (Damascus-Dar al-Sweida). Asked who was starving his western front of arms and munitions, Col. Hashim said cryptically: “The backer countries. “The Unified Command apportions the military aid it receives. I voiced my objections at previous official meetings, saying I had my reservations about The Command unfairly arming one front at the expense of another. The coastal front has received very little. “We have been hoarding arms and munitions and planning this offensive (since Antalya). Reacting to Col. Hashim’s remarks, Egyptian military strategy analyst Maj. Gen. (Ret.) Safwat el-Zayyat told Aljazeera’s news anchor: “Had the armed opposition opened the western front earlier, it could have helped the other fronts immensely. “The coastal front is the revolution’s success story of the year. It seems the man, Mustafa Hashim, fears being starved of weapons. “The big question is: Are revolution backers shying away from killing (Assad’s) hopes of a safe haven in a rump coastal state? Are they trying to stave off a sectarian bloodbath (in the Alawite stronghold), which is the regime’s recruitment reservoir, now that mountain villagers have started fleeing to Latakia city? Within 24 hours of the Latakia offensive kicking off, Khaled Yacoub Oweis wrote in a Reuters dispatch, “A senior opposition figure, who declined to be named, said the United States, a main backer of the Free Syrian Army, is against targeting Latakia, because it could spark revenge attacks by Alawites against its majority Sunni population and add to an already huge refugee problem. In Washington yesterday, State Department spokesperson Jen Psaki told a press briefing former U.S. ambassador to Syria Robert Ford “is in Paris today and tomorrow. He’s meeting with members of the Syrian opposition to discuss the prospects of a Geneva conference. “We remain committed to helping Syrians negotiate a political settlement along the lines of the June 2012 Geneva communiqué. “One thing I would emphasize is on Syria while Sergei and I do not always agree completely on responsibility for the bloodshed or on some of the ways forward, both of us and our countries agree that to avoid institutional collapse and descent into chaos, the ultimate answer is a negotiated political solution," Kerry said. However, Lavrov suggested the main cause for urgency in the Russian view is an influx of Islamic militant fighters into Syria.